You'd like to get paid to write online, but many websites are looking for contributors with experience. If you don't have significant experience, what can you do? Good news! There are a lot of websites, small and large, that will pay you regardless of experience. If you've ever looked at a greeting card and thought, "I could do that," written a poem or short fiction, thought you could do a better job on a research based article than what you've read online, are an expert hobbyist or more, you could be earning hundreds or thousands in extra income a year. Below is a list of 22 sites that pay for your writing. It isn't comprehensive, but is merely meant to provide a wide range of examples of paid writing opportunities. 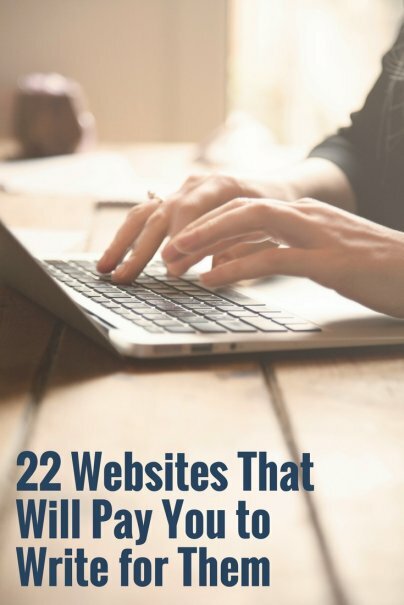 Use it as a guide to help you find many more sites that will pay you, too! ADDitude is an online magazine is devoted to providing strategies and support for people who are living with ADHD and other learning disabilities. Though they typically accept guest contributions from journalists and mental health professionals, they are also looking for writings from lay people who have personal experience with ADHD and other learning disabilities. Articles should be no more than 2000 words, and payment amount is calculated based on many factors including length, and experience with the topic. Vaping is all the rage right now. So if you're an enthusiast, why not consider getting paid to write an article for the Ashtray Blog? They are looking for those that focus on vaping, harm reduction, electronic cigarettes, or similar related topics. The pay rate varies, but typically starts at $50 for a shorter piece (think 500 words) that doesn't require a ton of research. The bi-monthly devotional magazine Alive Now will pay a minimum of $35 for a submission that is accepted. They provide the themes, which can help you structure your submission. Owned by SparkPeople, a popular online preventative healthcare website, BabyFit focuses on fitness and nutrition when pregnant and as a parent. If you can write a well-researched article between 500 and 1200 words, you may be interested in submitting one to this site. They pay contributors between $25 and $90 for their expertise. If you can write contemporary prose or poetry focusing on personal experience, check out Blue Mountain Arts. This greeting card company will pay you $300 for exclusive rights to your poem, or $50 for one time use in a book. Obsessed with toy trains? Could you write about them? Well, Classic Toy Trains accepts articles on this very topic and they pay $75 per page. Chicken Soup for the Soul, which is also responsible for the best-selling books with that same name, will pay you $200 for an "inspirational, true story or poem about ordinary people having extraordinary experiences," or $100 for a devotional. Submissions should be no more than 1200 words in length. Adult humor greeting card company Comstock is looking for ideas and will pay you $50 for each one accepted. If you're knowledgeable about computer programming and design, and can write a tutorial, this website might be for you. Developer Tutorials is looking for list-based articles and will pay for accepted contributions. The rate depends on many factors, such as length and quality of the tutorial, as well as the demand for your particular lesson. Their greeting card division, P.S. Greetings Inc., which manufactures "everyday" greeting cards and has an extensive Christmas program, is accepting submissions to be featured on their rack and box set cards. Compensation is decided on a case-by-case basis. If you enjoy building or know a lot about model airplanes, cars, ships, etc. then you could earn some extra money writing about them at FineScale Modeler. This magazine pays for articles between 750–2500 words, and the payment amount is based on the length of the article. If you have a daughter, sister, niece, or female friend who is younger than 18 and likes to write, create poetry, or short fiction, she can earn money if her submission to Girl's Life is accepted. Payment amount is decided on a case-by-case basis. Glimmer Train has been devoted to discovering new writers since 1990 and pays up to $700 for first publication rights for accepted stories. High Country News is a non-profit magazine focusing on the American West ("people, politics, culture, and aesthetic values"). If you like writing on these topics, they will pay you .50 to $1.50 per word (yes, per word) depending on your writing experience and their experience with you. If a submission is accepted and they decide not to run it, you will receive a 25% kill fee (a percentage of what you would have received had the article run). This greeting card company is looking for humorous greeting card ideas, so if you have a knack for that, send them to Oatmeal Studios. They'll pay $75 for each idea that is accepted. The Hairpin focuses on women and features (mostly) women writers. The topics are varied and wide-ranging, from celebrity culture to tips for creating a great cover letter. They are looking for original, unpublished content, and pay contributors for their work. BlogMutt produces blog posts for businesses in just about every industry imaginable, from pet boutiques to tech services. If you can write on a wide variety of topics — especially in the tech industry — you'll have a lot of available work. There are no deadlines or assignments, so you can write at your own pace. Customers provide the topics they need blog posts on, writers submit posts on the topics they choose, and the customers pick the posts they want. There’s no guaranteed sale, but most writers have a 90% acceptance rate. Adult humor greeting card company, Smart Alex, is looking for submissions that are "funny, edgy, and risque…topical, witty, smart, ironic, or sexually suggestive." Compensation is discussed once a submission is accepted. Recognized for its libraries devoted to exhibits in in science, art, history, and pop culture, Smithsonian Magazine will pay authors whose submissions are accepted. Hard numbers are hard to come by, and as you can imagine, they receive a lot of submissions, but it looks like an article could earn up to $1500 for a piece they like. Tales to Go is a paid subscription website and book publisher focusing on stories about travel. They are looking for personal, non-fiction stories and anecdotes, especially to unfamiliar areas. Stories should be between 1000 and 3000 words. Works that are accepted will receive a $50 honorarium. The Secret Place is a quarterly devotional made up exclusively of freelance writers. They pay $20 per accepted meditation devotion which should be about 150-200 words. The Sun is an ad-free paid subscription website that focuses on many aspects of the human experience. They pay contributors anywhere from $300 to $2500 for their work and are looking for essays, interviews, fiction, or poetry. They even throw in a complimentary one-year subscription to their magazine. This list really is the tip of the iceberg, and many writers, including myself, have had positive experiences and enjoyed the extra income. Let's grow this list. Let me know about your favorite sites in the comments below! Have you earned extra cash with your writing? Where'd you sell it? The prices paid certainly reflect the 30 second lifespan of today's cyber journalists, no fact checking needed, just a word count. Well you see here's the thing about that, generally the pieces are read and accepted before being published and paid for. Kind of like how, although you might not check to see if there's a poisonous element in your food, the fda tries to keep on top of that. Have you written much? Thanks for the list. I plan to check some of these out. Sorry for the delay in response. I missed this comment. You are quite welcome. Hope you have good luck with the list! I'm so glad! Have fun with it! Navigating the websites that don't expect something for nothing is a huge task. This is a good beginner's summary. Thanks, Carisa! It does take some effort to mine, but there's a lot of stuff out there. Great resources! Thanks for sharing possible opportunities for inexperienced writers like me. You're welcome, Candra! I hope you try some out. This is absolutely the best collection of these types of websites I have ever seen, and I've read a lot of them. For the last two years I've built a portfolio of work via Elance and oDesk (now Upwork). This has given me the confidence to move on to working independently. Four of the sites you mentioned immediately piqued my interest, and I look forward to work which interests me rather than writing whatever sells for someone else (writing for hire). I linked this article to my new blog post at TheWriteWayOut.com. My writing has enabled me to live a location independent lifestyle for three years now. I'm loving every minute of it and looking forward to bigger and better projects in 2016, thanks, in part, to your article. I even recommended the GirlsLife site to my 13 granddaughter who is a budding writer. Thank you for posting this article, it's super! I've never submitted a work for publication but I do have a few short stories that just might be candidates for publication. I'm guessing I am not alone when I say I didn't know who I could contact to offer my stories for publication. Your article gives me some hope and I'm thankful to you for that. I am not saying I have great stories but my Mother likes them and she claims she is totally unbiased. When I read them aloud my dog didn't leave the room either. These positive indicators are so massively encouraging that I am ready to take the next step. I've been looking into starting some freelance writing. Thank you for sharing these websites. I'm sure they will be lucrative endeavours. After having a search on Google, I found useful information on this article, different in 'writer opportunities' from other sites. This article is unique in that way. But the leads are favoring US residents, not world wide. Still the information is useful to pass on to my friends looking for similar information. Thanks. Wow, I never realized there were that many publications looking for freelance writers. This is an awesome resource. Thank you do much for sharing. I think starting a blog from scratch has a much bigger upside as it is quite a lot of effort to create genuinely interesting content and if you are going to do that you might as well create your own blog. Thank you very much for your great list, I need to plan to check it out soon.